Be aware that all Wedding Photography packages include travel up to 20 miles of the Tucson, AZ area. Anything beyond the 20 miles there will be additional 10% increase to your wedding package. Lodging and meals will need to be provided, and lodging needs to be within 5 miles or less of the area of your wedding venue. If the Wedding Photography is more than 150 miles outside the Tucson area (Limited to the state of Arizona) there will be a one time charge of $750.00 in addition to your package instead of the 10% increase. Lodging and meals will need to be provided, and lodging needs to be within 5 miles or less of the area of your shoot. For Wedding Photography outside the state of Arizona there will be a one time charge of $1000.00 for your wedding day packages. In addition to the $1000.00 fee all arrangements of Plane travel, Car rental, Lodging and Meals, and any other expenses will need to be provided and paid for by the client. All arrangement will be mutually agreed upon before contract is signed. This is a non negotiable policy. Please be aware that I am a Tucson Photographer, but I have no problem traveling outside the 20 miles of Tucson area. The reason that my travel policy even exists is because I need to make sure that there are not any issues in regards to getting to your wedding on time, or being available for you. As I also attend wedding rehearsals this doubles my travel distance. By ensuring that I am very close to the venue I can make sure that your wedding day goes very smoothly. 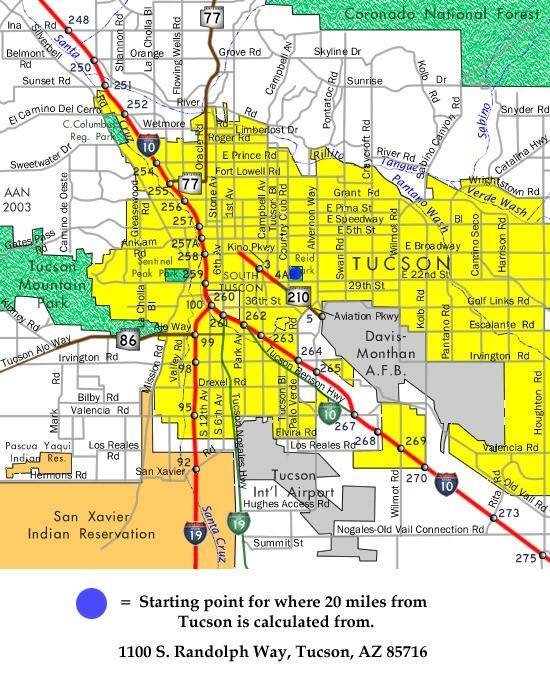 Just use the blue dot, and address as a reference point to determine if you are within 20 miles of Tucson, or if you are outside that area. I use Reid Park as the starting reference point because it is at the center of town. * If in the event that the location of your wedding is beyond the 20 miles and there are not reasonable accommodations for a hotel, a fee of 15% will be added to your package to accommodate extra travel up to 50 miles. Beyond 50 miles if hotel arrangements or lodging is not possible I cannot photograph your wedding.